Join The Worcester Mineral Club Today! Find out how to join the Worcester Mineral Club Today! Have a look at some photos from our past field trips and from members. Stop by at one of our monthly meetings. Everyone is welcome. If you like what you see then join the club! Worcester Mineral Club has their very own claim in Fonda, NY where you can go to mine for Herkimer Diamonds. Worcester Mineral Club invites new members to join the club. Click here to find out more about how to join today. Meeting held at Trinity Episcopal Church, 440 Main Street, Shrewsbury, MA Click HERE for a map. Everyone is welcome. Stop by and see what we are all about. Click here to Join Online! Congratulations to Paul N. of Auburn, MA! 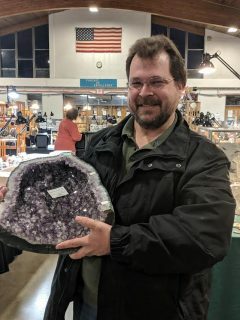 His raffle ticket was drawn at the end of our show yesterday, we gave him a call to let him know he was the lucky winner, and Paul drove right over to pick up his beautiful amethyst. Thanks to everyone who entered to win. Door Prize Winner for 2018! 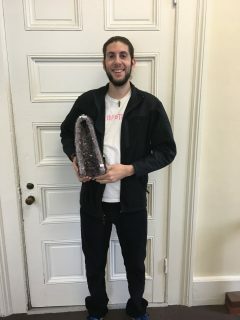 Donovan S. of Leominster, MA is the winner of the amethyst tower door prize; congratulations, Donovan! He was thrilled to win this gorgeous specimen. More photos from our show are posted on the Annual Show page.